This is a little distorted (showing less activity than actual), as I do a lot of operating without CQing, which is what the RBN picks up...but interesting nonetheless. I'm a member of the North Georgia QRP Club - a loosely organized group based roughly out of Atlanta, GA. I've had more enjoyment being a member of this club than any other in my 40 years as a ham. Part of that is due to the wide variety of talents shown by the various members. 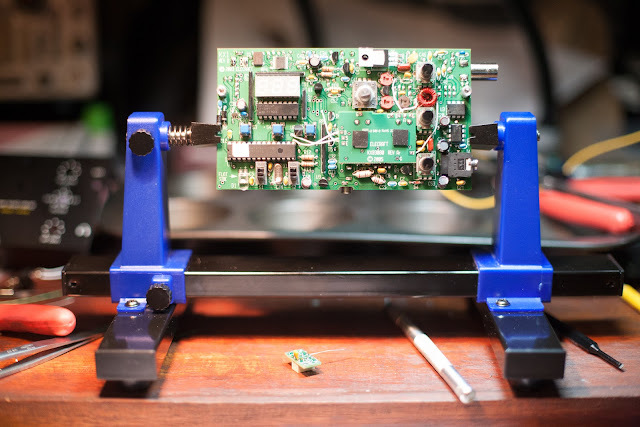 We've got members who have won the FDIM home-brew competition, at least two past presidents of QRPARCI, some good contesters and DXers, some fine programmers, superb CW ops, and even a few woodworkers in the group. The meetings generally detail some activities from each of these groups, all of which are impressive. One of the woodworkers is Paul Kelley, W4KLY. In addition to other woodworking projects, Paul has built a number of nice operating desks for Atlanta area hams. Another radio-related line he produces are wooden stands to fit a variety of QRP rigs. His latest stand is a stand designed to hold both the KX3 and matching PX3 panadapter. 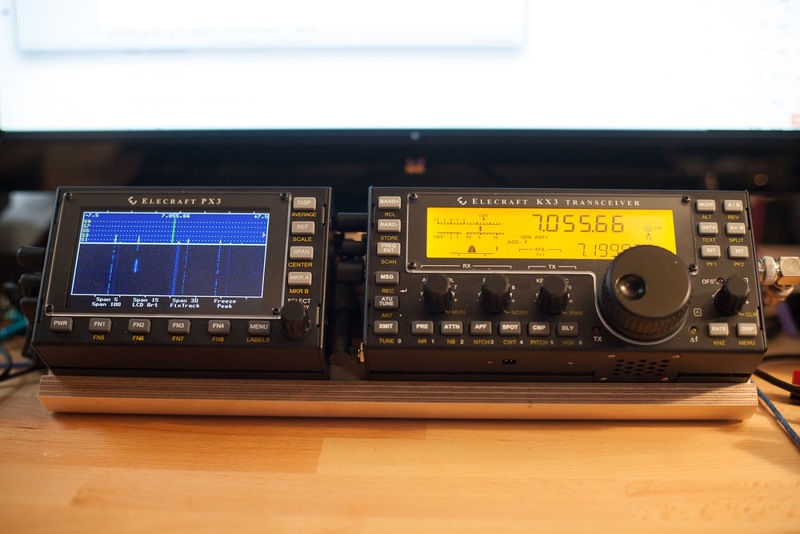 Early in this project, I commissioned Paul to build a side-by-side stand for my KX3/PX3. Ever since I'd gotten the PX3, I was bothered by it and the KX3 not staying in exact alignment with each other...not a real big deal, but I wanted the two connected more solidly. In talking to Paul, I also ordered a slightly more angled stand to fit my desk/chair heights and where I was planning on using the KX3. The resulting stand was awesome - just exactly what I ordered - and I was a fairly happy customer. The biggest problem I had with the side-by-side stand is that it's difficult to access the headphone jack on the KX3. My plan was to build an external amplifier/speaker and just leave that connected to the KX3 full-time with a switch to choose speakers and/or headphones. All in all, not a bad problem. Well, at the last NoGAQRP meeting, Paul approached me with a new stand he wanted me to try. He's gone through a lot of iterations trying to get his combo stand dialed it. This stand places the PX3 above the KX3, which eliminates the problem of bad headphone access. 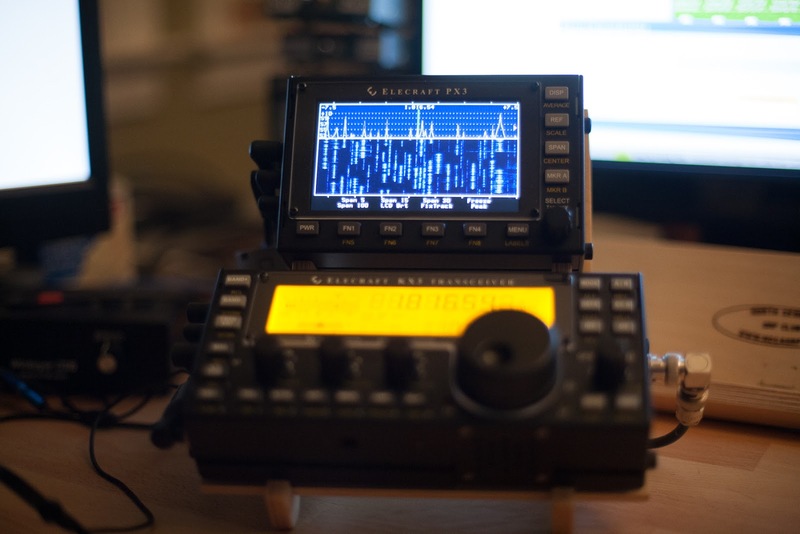 The KX3 is held at a shallower angle than my side-by-side stand, but because the stand is narrower, I can keep the radio right next to my keyboard, where the shallower angle works. I find this particularly comfortable during contests - the side-by-side stand requires a reach that isn't convenient during contests, or working split for that matter. Paul is known for his craftsmanship, and it shows in these stands. He uses two thicknesses of Baltic Birch plywood, micro-nails, and uses a CNC router to ensure consistent results in cutting out what really is a complex shape. 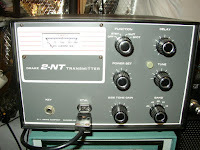 The stands are branded with the mark of the North Georgia QRP Club, and several coats of clear lacquer are applied. The stands are strong, but lightweight. I've seen other stands for the KX3, both commercial and home-made, and in my opinion, none of them hold a candle to Paul's stands. I recommend Paul's stands whole-heartedly. As I mentioned, I'm a member of NoGAQRP, and Paul does donate a portion of the proceeds of each stand to NoGAQRP. Also, in the interest of full disclosure, while I paid full price for my original stand, Paul did give me the latest version to try. None of which detracts from the fact that these are truly nice stands. 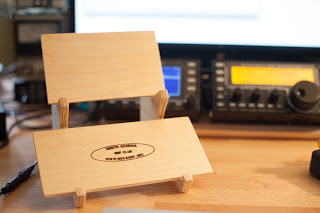 You can order your own stand from NoGAQRP Club, just follow the links on this page for pricing and ordering information. In addition to the over/under stand pictured here, Paul will entertain custom work as well, like he did for my original stand or you have an aftermarket heat-sink or other ideas. If you have any questions at all, I'm sure Paul would be happy to address them, as he's quite passionate about these stands. If you have any questions for me, just drop me an email via the addy listed on QRZ. Y'know...I really do need to post something positive here soon...but stuff like this shouldn't be passed up! This is K8CR pretending to work VK0EK in the hopes that his call will end up in the DXpedition's log (which it apparently did) - he probably doesn't even have his volume turned up! Friends, this is *not* the way to work DX! I had a boss one time tell me that no one is totally worthless, they can always serve as a bad example. Apparently K8CR has found his calling! I got an email overnight from JOHN P CHWALEK <johnk2iw@gmail.com> - or at least someone claiming to be John Chwalek - you may recall he's one of the ones who answered my WTB ad for a 2-NT and passed me along to a "friend" of his. 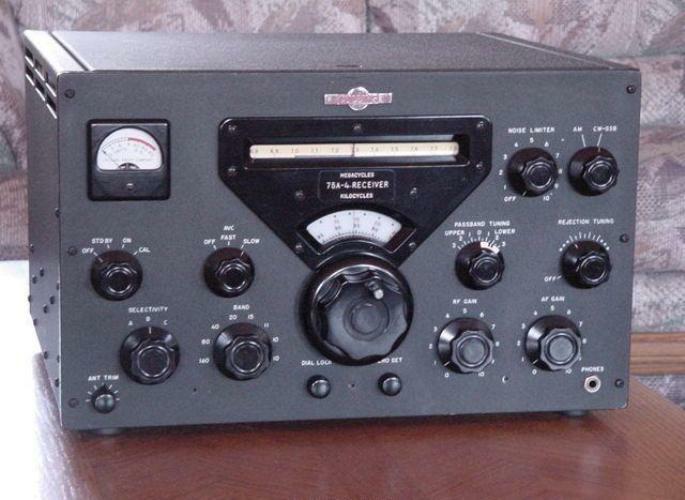 As it turns out, "John" has a Collins 75A4 that, for some reason, he thinks I might be interested in buying! interested let me know Thanks. I'd love to call you and talk about it....give me your phone number and I'll call later today. In the meantime, could you send some photos? 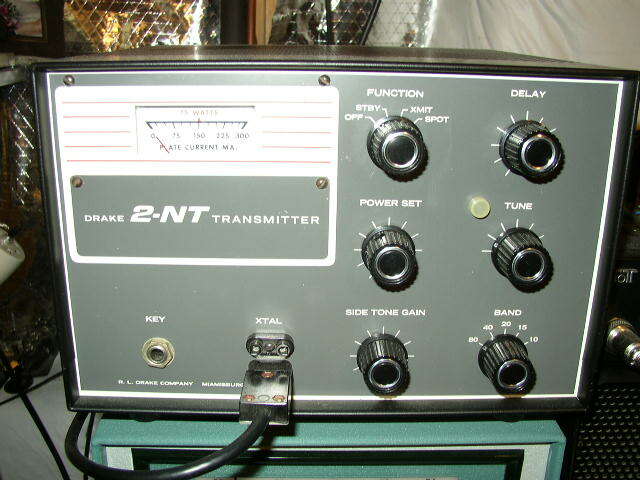 <ME>: How long have you had that radio....it looks to be in very good condition....did you have to replace the DSP module, or is the original OK? 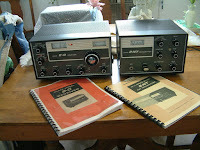 <"JOHN">: the radio is 14 months old and it still have the original DSP module..
<ME>: Are you the original owner? This was actually fun! There are several things wrong here, that I suspect most of the readers have already figured out! Additionally, the photo "John" sent is actually a photo from rigreference.com, from which that website's name was cropped out of the file. And the kicker is that OM John Chwalek has been a Silent Key since 2012! 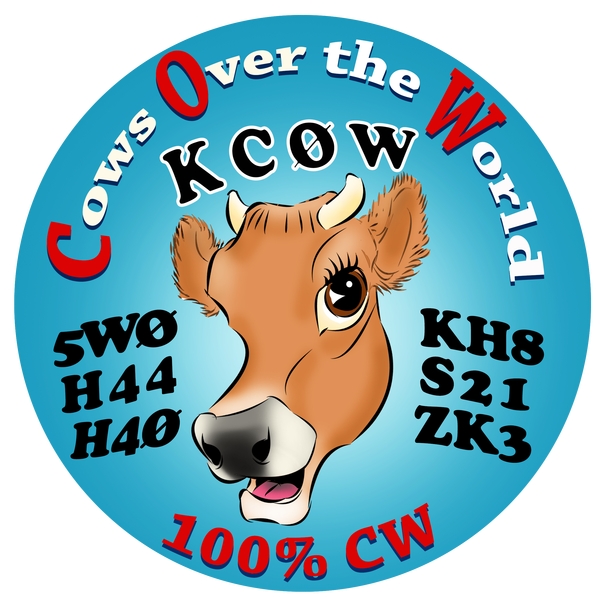 I don't think K2IW showed as an SK last week when I looked him up, but the QRZ record definitely reflects that now, so perhaps it was just recently brought to the attention of QRZ. RIP K2IW. And for the sake of folks looking to not get scammed, when I asked for the PayPal address to use, "John" said to use kaceyag@yahoo.com. Hopefully it will get picked up by Google ...or you may want to send him some email yourself!